Natasha: Sooner or later, Frank, someone was going to get the drop on you. The Avengers aren’t a fan of yourse, but I have my own agenda. And I know who bought the boat. SHIELD tells me this guy is in a Costa Rican prison. I want you to go find out who’s behind all of this. 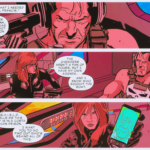 Black Widow #9 was the Punisher crossover, and we got a scene of Natasha pulling a gun on Frank that cut abruptly to the next day at SHIELD HQ. If you read the companion Punisher #9, you saw that Natasha put Frank in prison. (Damn Avengers.) In Punisher #11, though, we get the whole story: Natasha recruited Frank to find out more about the ghosts she is chasing. Beyond the obvious crossover, Edmondson has been building little links between his books. The Howling Commandoes, a black ops team in LA hunting the Punisher, are appearing in an upcoming issue of Black Widow, for example, and he’s said that some elements from these books will appear in Deathlok as well. 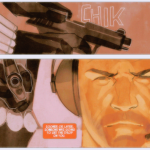 From Black Widow #9, by Nathan Edmondson and Phil Noto, & Punisher #11, by Edmondson and Mitch Gerads. 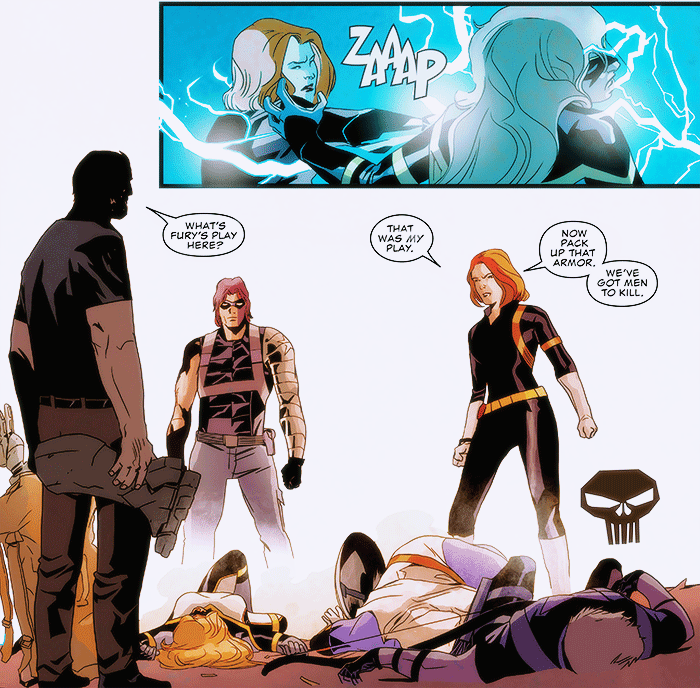 In honor of this week’s Punisher/Black Widow crossover, I thought I’d post a scene from one of my favorite Natasha comics of the past few years, Punisher War Zone #2. Greg Rucka’s excellent run on Punisher was a meditation on the power of missions— the way a mission can transfigure, make someone more than human, and less. 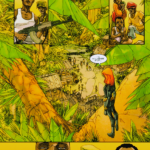 In this story Natasha spends a month tracking a nearly wordless Frank Castle to a remote jungle. But Frank loses her when he runs through a camp of child soldiers. She stops; she can’t abandon them until she knows they’re taken care of. Frank knows the score, knows the mission, is the mission in ways she cannot let herself be. From Punisher War Zone #2, by Greg Rucka and Carmine di Giandomencio. Natasha: No way of telling who it is the bullets were meant for. I save myself for obvious reasons— and spare the mad doctor as the only one knowing where and how far along his hellish missile is at. Firing a Widow’s Bite blast back along the trajectory. Too far to have an impact directly… but through the glass of a sniper’s scope, it’s as good as right on top of him, the burst blinding. From The Punisher & Black Widow: Spinning Doomsday’s Web, by D.G. Chichester and Larry Stroman. 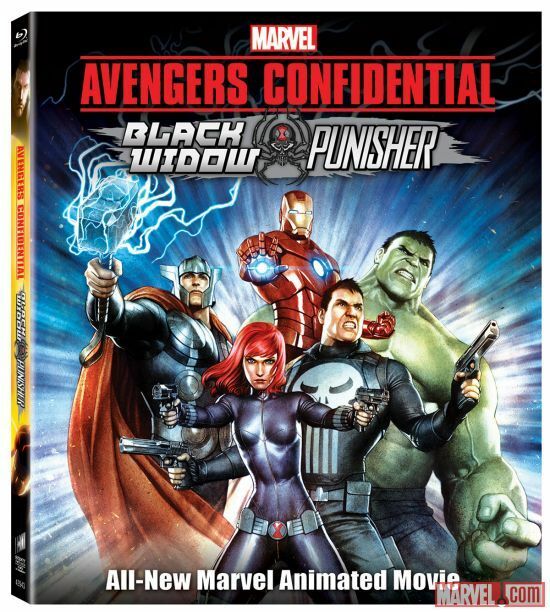 Marvel’s Avengers Confidential: Black Widow & Punisher, on DVD and Blu-Ray March 25. We’re also doing Punisher/Black Widow, which is another movie. It’s things like that, that don’t get the same amount of play the bigger shows do, that take up the day. Natasha: Now I’m going to find the Punisher. Logan: It’s a big world. Good luck with that. Natasha: Logan… I don’t use luck. For about a year now, Greg Rucka has been writing about the Punisher by not writing through the Punisher. I think certain characters, Batman is a really good example, and personally I like it when it’s done with Wolverine as well, work very well when you are watching them. I think you can get great story and really wonderful depth out of them and you don’t need to know everything that they’re thinking. Their actions almost universally speak louder than words. The added benefit, especially with somebody like Frank, is seeing the effects of his morally gray actions on the people around him. He’s most assuredly an anti-hero and he is the center of this whirlpool that’s getting closer and closer to him… The closer we spiral to the whirlpool, though, the more opportunity there will be to hear him speak, the more of him will be revealed. 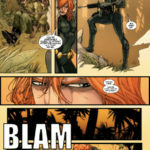 This has been a recurring theme in Rucka’s work— in his Wolverine run, in Gotham Central, where the Batman was little more than a shadow in the sky, and even in some of his Black Widow work, where Natasha’s ruthlessness was characterized through Yelena’s reaction. It’s an approach that works because Rucka is also fascinated by the routine, by the procedural. His characters are very often defined by their protocol, the rules they make for themselves, and how they have to bend rules or bend themselves to suit them. Punisher: War Zone #2 is about Natasha’s hunt for Frank Castle. Natasha is a professional, one of those rare superheroes whose job is being a superhero, whose superhero identity is likewise defined by her job. Her “powers” such as they are, are really skills, tools she’s acquired from a lifetime of being used as a tool. In classic Marvel fashion, her competence is the gift and the curse together, and a tension exists between what she can do and why she is doing it. The plot, of course, focuses much more on the what than the why, as actions do, as Natasha’s secrecy is her prerogative. Spider-man forces a confrontation, Captain America sees a moral responsibility. Natasha does her job. Natasha: What do I owe you? Oleg: Two cows and a bottle of vodka. Natasha: I’m pouring as fast as you drink Oleg Mihailovich, the cows may take me a little while longer. Oleg: Forget the cows. Putin will only steal them to give to his friends. This man, Castle. Why are you looking for him? Natasha: I get bored easily. Oleg: I do not believe you for a moment. Natasha tries to glean information from Castle’s accomplices by posing as a legal aid worker. She pieces together Wolverine’s actions from the previous issues by piecing together closed-circuit satellite footage. She follows Frank’s trail from the Ukraine to the desert to the jungle. She has contacts everywhere, and she pours drinks for Oleg Mihailovich but she doesn’t take a sip herself. There is no escaping the Black Widow. She has a job to do, and she’s very good at it, and she knows it. The Black Widow keeps reading. Frank Castle is interesting because he’s a vigilante without being a superhero, and his existence forces everyone else who wears primary color spandex to look at their life, look at their choices, and make sure they aren’t the same. In stopping the Punisher, the Avengers must make sure that they don’t become him. For some of them, there’s an easy line to draw— the Punisher kills, and heroes don’t. But Natasha doesn’t have that luxury. For her, killing is not just a possible solution, but possibly a mercy. She has death on her hands and in her bones and that has always been wound through her heroism. Captain Castle! My name is Natasha Romanova! I am here to bring you in! There’s even a weary routine to the requisite fight scene. “You’re stronger. I’m quicker. Do we really have to do this?” But they know that they do, because that’s the protocol for these sorts of stories. Two costumes meet, and then they fight. We just had a whole big crossover stapled around this concept, you might have heard of it, I forget what it’s called. But this isn’t a book that concerns itself by determining winners and losers. Frank isn’t afraid to run, and Natasha isn’t afraid to follow. She tells him that she will follow him to the ends of the earth, because she already has. She tells him that it won’t stop with her, and Frank believes her. This is her job, and she is a professional. And that’s why he winds her through a camp filled with child soldiers. Earlier today someone asked me if this issue saw a “different approach of her humanity” but Natasha has always taken up her cruel business for compassionate reasons. Look, Natasha’s introduction to this Punisher affair is in the first issue when she reads the newspaper. These newspaper articles don’t just speak to the cops who were killed, but the arrest of Rachel Cole-Alves, the Punisher’s accomplice. Rachel defense attorney is Matt Murdock, a close friend of Natasha’s, and Matt thinks that Rachel’s been “brainwashed” by Frank Castle, that her plea should be not guilty by reason of mental defect. 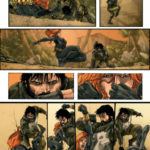 Natasha doesn’t just go to Rachel to find out where Frank Castle’s run off to— she goes to plead for her life. Natasha: —what happened to you? Are you hurt? Rachel: It’s nothing. And I don’t want your help. Natasha: This isn’t about guilt or innocence. This is about the fact that the D.A. is seeking the death penalty. It’s not a legal question, it’s a moral one. Or are you saying you want to die? When Natasha catches up to Frank Castle, the first thing she says to him, after she introduces herself, is that Rachel Cole-Alves is about to die. Sergeant Cole-Alves, his friend. Frank says he has no friends. So here, finally, without either of them speaking it, is the difference between the Punisher and Black Widow. Frank can run through a camp full of starving, sick children, because his mission is punishing the guilty, and he is his mission. Natasha can’t, because her supreme protocol is survival. It’s not catching Frank Castle, it’s helping other people survive. If she loses that, if she deviates, all her competence is for less than nothing. She’s just the tool her old masters tried to make her. Natasha has friends. She has Logan, and she has Matt Murdock, and she has people like Oleg Mihailovich, people that know her and remember her fondly, as something besides a symbol on the wind. And that’s cost her something. She couldn’t catch the Punisher. She wouldn’t have given up the chase, but she had to stop, for awhile. It’s an approach that lets her be hyper-competent but still multi-faceted, when so many writers make her one at the expense of the other, or worse, neither of these things at all. It’s also an approach that says a lot about Frank Castle without having Frank Castle say much of anything. You have to be a scary sonofabitch to stick so hard to a mission, to never go back and never turn yourself quite inside out because of it. Natasha is heroic in her complications, Frank Castle is powerful in his deceptive simplicity. There’s a weird lapse in continuity, for a writer handling two characters he’s obviously thought out. 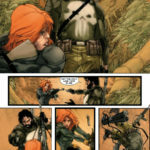 The issue plays itself like Frank and Natasha’s first meeting, but they co-starred in both volumes of Marvel Knights and in the graphic novel Punisher/Black Widow: Spinning Doomsday’s Web. The art also suffers some missteps. Though there are a few panels with really charming facial expressions and and Giandomenico does a fair Checchetto impersonation, there’s a certain stiffness to the action scenes. I’m not sure if this is because Giandomencio is hamstrung a bit by having to match Checchetto’s style, but I do think this mini lacks a bit without its disarmingly pretty art. Still, what’s there is serviceable and the character work is top-notch. This is the best Natasha’s been written in a year, which says something sad about the substance of her appearances in this year of all years, but also says quite a bit for the sheer amount of thought Rucka puts into his character work. In a genre where people really get attached to characters, that means a lot. Natasha: …but through the glass of the sniper’s scope, it’s as good as right on top of him, the burst blinding. So Punisher War Zone #2 is out this week, and I plugged it earlier when the preview came out, and I’m plugging it again now because it’s seriously the best Natasha’s been written since Warren Ellis did his thing a year ago, and Natasha fans might miss it because it’s called Punisher and not Avengers. I’ll post a full review over the weekend, probably, even though I usually wait for arcs to close out so that I can talk about them in context. I just want to talk about this issue that bad. One think Rucka seemed to have forgotten, though, is that Natasha and Frank have met many times before. This is one of those times. What do you know, they fought. 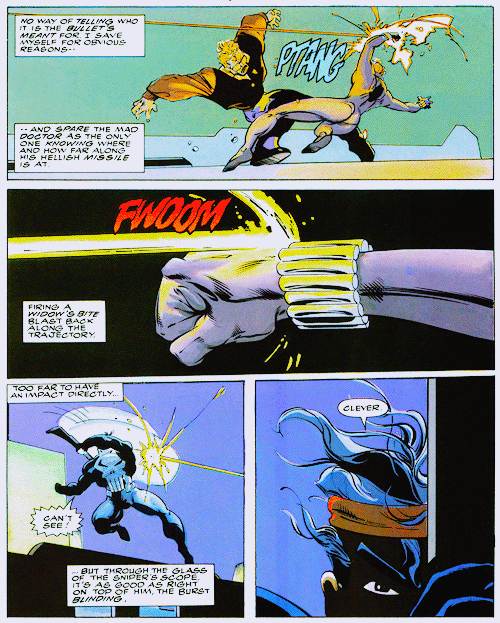 Notice how Natasha deflects a bullet with her fists like it’s not even worth internally narrating. 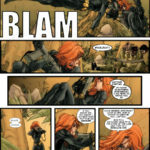 From Punisher/Black Widow: Spinning Doomsday’s Web by D.G. Chichester and Larry Stroman.